One solution for expanding your living space is to build a home addition. A properly thought out set of home addition plans can transform a small home into a large and luxurious one with many of the same amenities found in a new and larger home. Beyond providing additional living space, building a home addition offers many other benefits over building or buying a new home. A home addition enables you to continue to live in the same neighborhood. It allows your children to continue to attend their current schools. 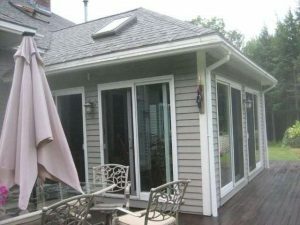 A home addition can also offer some significant cost savings over trading up to a larger home. For example, there are no real estate agent costs, stamp taxes, and utility turn on/off service fees to deal with when building a home addition. Once you have your set of high level home addition goals and concerns, you can then begin to develop a formal set of home addition plans. You have a few options when designing your home addition plans. You can draw up your own home addition plans with pencil and graph paper, use a home remodeling design software package, buy home addition plans off of the internet, work with a local architect, or use some combination of all of these methods. Unless you have very basic home addition plans, I would highly recommend the services of an architect. If you have an idea of what you are looking for in your home addition plans, either from a similar home that you have seen and have snapped some pictures of, or home addition plans you have found on the internet, bring them with you when meeting with the architect. Between understanding your top level home addition objectives and viewing your snapped or printed pictures and/or drawings, the architect should be able to formulate a good set of draft home addition plans. After you have reviewed the draft plans he/she can refine them as needed to provide you with a complete set of home addition plans. A few iterations may be necessary to complete the final set of home addition plans, but in the end you will get a better product. In addition, the home addition plans should include everything you need to pull permits and to solicit home remodeling contractor bids. When formulating your home addition plans, pay as much attention to the outside design as the inside. The last thing you want is an albatross hanging off the side of your existing home. Also determine if you want to be the general contractor and hire all of the sub-contractors or hire a general contractor to do all of the sub-contractor hiring for you. Managing half a dozen sub-contractors can be quite the challenge. It is akin to herding cats, mood swings included. To conclude, before jumping into a home addition project, make sure you have written down your main objects, generated a complete set of home addition plans, and hire the right home remodeling contractors. By doing all of these steps you will dramatically improve your chances of getting the home addition of your dreams. Keep in mind, however, a home addition takes time and presents its share of family inconvenience.